These Slate tiles were installed in the kitchen of a house in Glasgow and as you can see from the photograph below they were looking dull and tired and there was evidence of grout haze over a lot of the tiles. 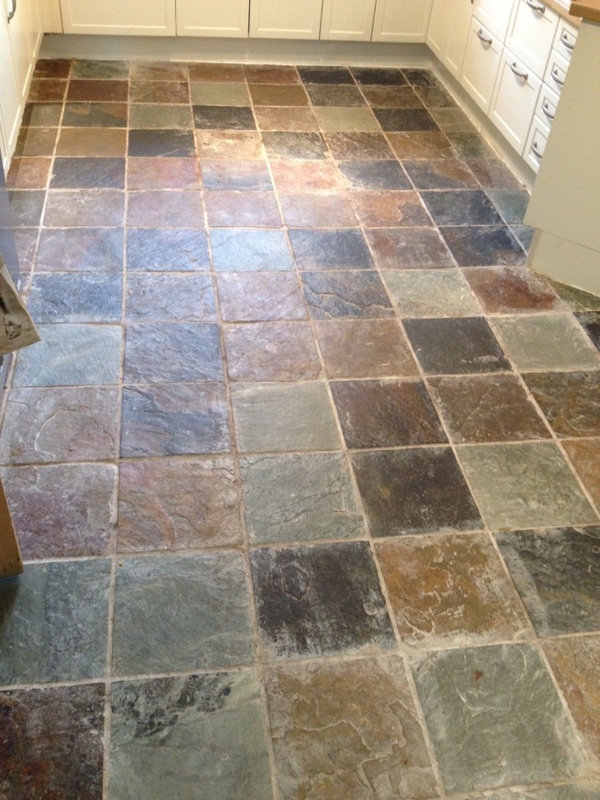 The Tile Doctor diagnosis was that a face lift was in order for which a deep clean and re-seal was prescribed. The first step was to sweep up all the loose debris from the floor; we scrub the floor quite hard during our work so it’s important to remove any grit that could scratch the surface of the tile. We then mixed a dilution of Tile Doctor Remove and Go 50/50 with Nanotech Ultra Clean and began to work the solution into the floor allowing it to dwell for around an hour first (This process helps to soften and break down the remains of the sealer on the stone). We used a hard deck scrubber to agitate the chemicals and loosen the dirt and old sealer from the floor which is then extracted from the surface using a wet vacuum and rinsed down with clean water several times to make sure all chemicals are removed. The next step was to apply a dilution of Tile Doctor Grout Clean-up which was then scrubbed the floor once again with hard deck scrubber. This broke down and removed all of the cement/ grout haze that the installer had left over the surface of the tile, again the floor was then rinsed with water and extracted to remove any chemical residue. The floor was scrubbed again this time using a dilution of Tile Doctor Pro-Clean to make sure all old sealer, cement, grout haze and dirt had been completely removed. We then give the floor a thorough and final rinse and mopped the tiles with Neutral Tile Cleaner to neutralise any remaining trace of chemicals and removed the solution using the wet vacuum before leaving the floor to dry overnight. Once the floor was dry it was then sealed using five coats of Tile Doctor Seal and Go which was chosen to provide the desired finish that the customer wanted. 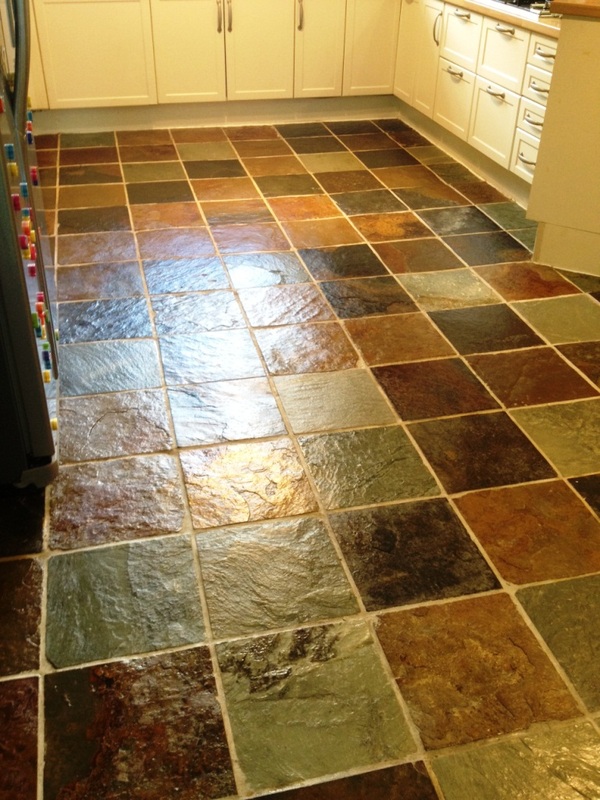 This entry was posted in Slate Tile Posts and tagged cleaning services, floor maintenance, Glasgow, kitchen cleaning, kitchen tiles, slate tile cleaning, slate tiles, tile cleaning, tile restoration, tile sealing, tiled floor by AbzDominise. Bookmark the permalink.